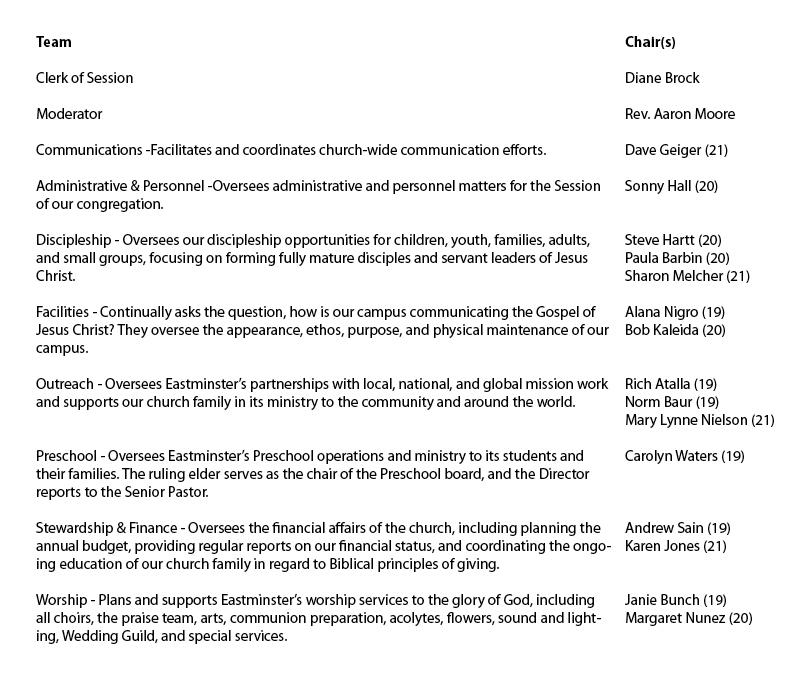 Our Staff, in coordination with Session elders and the Deacon Board, carry out the ministry and programming of the church. 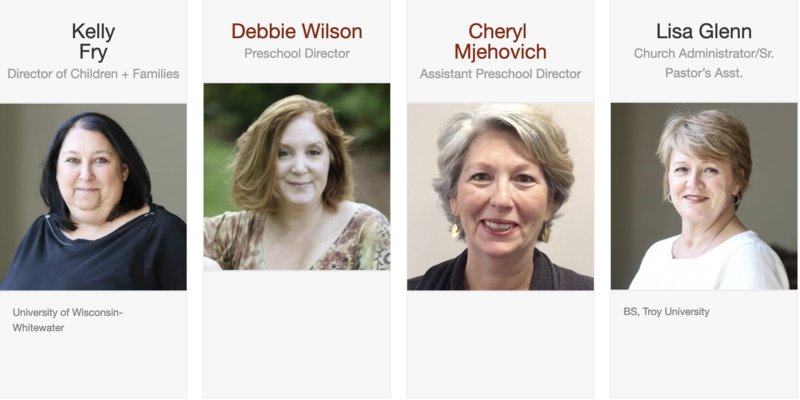 Look below to meet our staff members and find out how you can reach them. Our Leadership The governance of Eastminster is Presbyterian, in the tradition of the Reformation. That means you can expect an emphasis on the Bible as the Word of God; the importance of Knowing God for your own salvation; and a lot of education and training in Christian living and leadership. You can also expect to know what’s going on and participate in important decisions through your vote as a member. In our church, you’ll soon find a large group of leaders encouraging you to grow in your faith and learn more about following Jesus as a disciple. 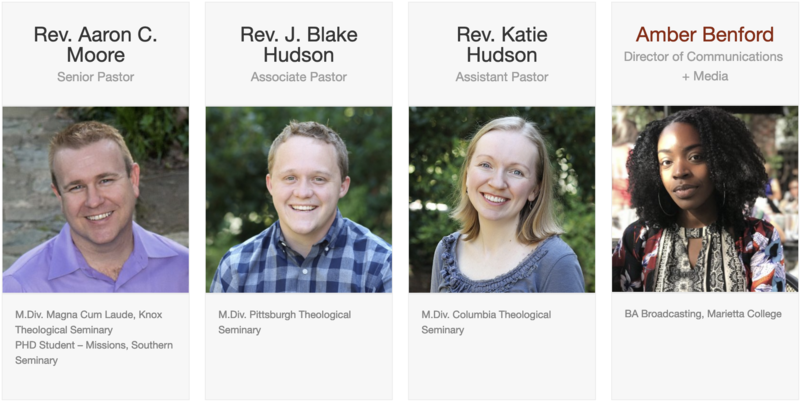 Reflecting the forms of the early church found in scripture, we recognize two ordained offices: Elder and Deacon. Our ministers are ‘teaching elders.’ Believing firmly in Jesus Christ as the active head of our church, the elders gather monthly in a Session of discernment, seeking to order our life and mission as a church under the will of Christ. This is where the direction of our church is set and important decisions deliberated before the Lord as we search the Scriptures and seek to love the Lord with all we are. The Deacon Board meets regularly to plan and inspire acts of service to the church and community, encouraging us all to bear one another’s burdens with joy and love our neighbors as ourselves. Our Elders are elected leaders who form our ‘Session.’ This is prayerfully deliberates the everyday matters that affect the life of the church. 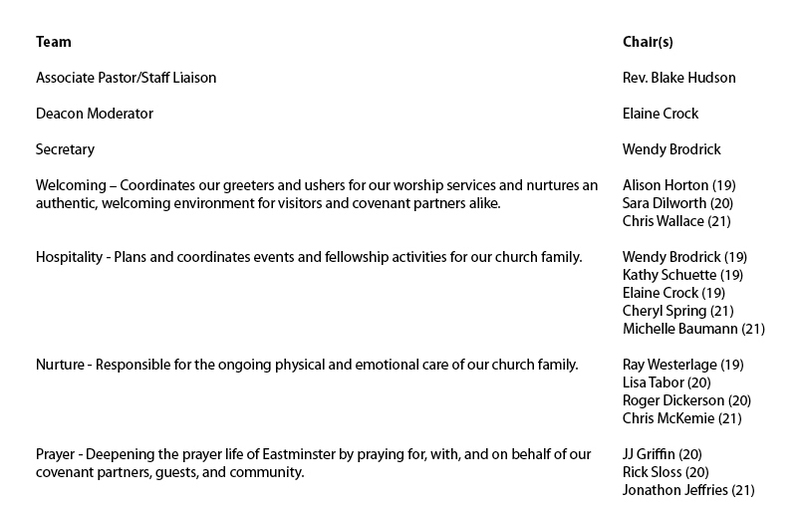 The Deacon Board of Eastminster shows Christ’s love and mercy by welcoming, supporting, and encouraging the fellowship of believers through prayer, nurture, and hospitality.